Confession: When Mrs. Cooks Food Good and I got back from a week in Italy, we both craved, and subsequently smashed, two Italian beef sandwiches. These sandwiches are a perfect amalgamation of Italian flavors and American meaty boldness, and they acclimated us back into the States properly. This pasta is a nod to those Italian Beef sandwiches I miss so much, with the added benefit of being a weeknight pantry go-to. The giardiniera and the capers add a salty acidic note, gently mellowed by a hint of the savory beef stock. In a large pot, bring 6 quarts of water to a rolling boil. Season the water with a pinch of salt. Cook the pasta to just short of al dente, reserving a 1/3 cup of pasta water. As the pasta cooks, heat a tablespoon of olive oil over medium-low heat in a large saucepan (big enough for the pasta to soon enter). Add the garlic and pepper flakes and cook for one minute, stirring as to not burn. Add in beef stock and oregano, bring to a simmer. When the pasta is just shy of al dente, drain and add to the saucepan along with the pasta water. Simmer for 1-2 minutes, tossing the pasta with the sauce. Turn off the heat, and gently stir in the capers, brine, and a heavy grind of pepper. 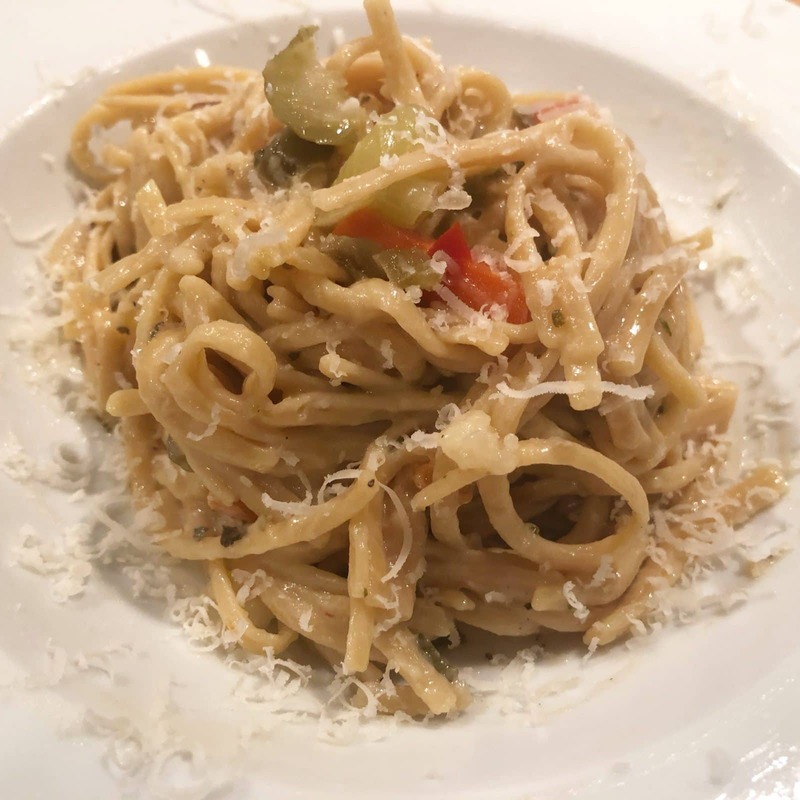 Serve immediately, garnished with the chopped giardiniera, drizzle of olive oil, and (optional but recommended) Parmesan cheese.